Henry Holt and Co. (BYR), 9780805063271, 56pp. 'My Hero' to Be Chosen: Eight finalists will compete tonight for the title My Hero. The winner will wear the coveted gold Hero medal. These brave and courageous dogs will each appear with their nominator who will tell their story. There's Smiley, who fought a giant bull. Bear used his giant paws to save the life of another dog. Munchkin warned a gardener of a poisonous snake about to strike. Old Dog helped find people buried under rubble after a tornado. Buster pulled a baby carriage out of the path of a careening truck. Blue, who had never been known to bark, used his voice to bring help to his wounded master. Dopey's constant barking saved the life of a baby left in a sweltering car. Little Bit brought love and companionship to a nursing home resident. Each story is told in the unique, sometimes humorous, but always Compelling voice of the person whose life was changed by the heroic action of a very extraordinary dog. Betsy Byars and her daughters Betsy Duffey and Laurie Myers have joined forces to create dog stories full of adventure and suspense. Loren Long's paintings capture the heroic dignity of each of the dogs and heighten the drama of their special stories. Loren Long has illustrated greeting cards, book jackets and magazines. 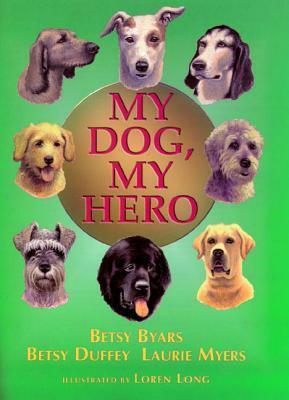 My Dog, My Hero is his first children's book. He lives near Cincinnati, Ohio with his wife and their two sons.